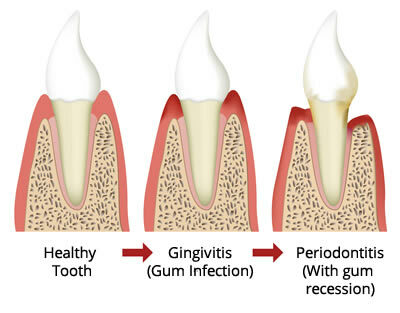 Gum disease (periodontal disease) is inflammation or infection of the gums caused by bacteria found in plaque and calculus and is split into two categories depending on severity, Gingivitis and Periodontitis. Gingivitis is usually caused by the bacteria found in plaque which is a soft film that deposits on the surfaces of the teeth and gums. If plaque is not sufficiently removed, the bacteria breads in between the teeth, on and under the gums. As the body tries to fight the effects of the bacteria, the gums become inflamed, appear red and bleeding is often noticed when brushing. Bad breath can also present with gingivitis. Periodontitis is a serious progression of gingivitis if it is left untreated and is the number one cause for tooth loss. Periodontitis means inflammation around the tooth and affects all the supporting tissues and as a consequence, over time a gap known as a pocket can develop around the tooth and if left untreated, can lead to tooth loss as it eventually destroys the bone. In addition to these symptoms, bad breath or halitosis presents also. Our dental practitioners at ConfiDental Clinic, Streatham, are passionate about promoting oral health and preventative dentistry. The health of your gums will be examined during your check-ups. We strongly advise you to book an examination if you notice or suspect any symptoms of gingivitis or periodontitis as early diagnosis is vital. The effects of gingivitis can usually be reversed if diagnosed and treated by your dental practitioner or hygienist early and by maintaining a thorough oral hygiene regime which must include regular tooth brushing at least 2 minutes twice a day and using interdental aids such as floss or interdental brushes to clean in between the teeth. Tooth brushing alone is not sufficient and failure to carry out interdental cleaning means as much as 40% of your teeth surfaces are not being cleaned. A fluoride mouthwash can be used in addition to this regime during the day after meals to disrupt the bacteria present in plaque. Your practitioner at ConfiDental Clinic, Streatham will advise a treatment plan which involves thorough cleaning of the teeth and gums using specialised instruments to remove deposits of plaque and calculus. If pockets are present, cleaning may involve under the gums surface (sub gingival) which can be carried out under a local anaesthetic to prevent discomfort during treatment. Depending on each individual case, treatment may require further appointments to ensure all affected areas are treated extensively. Your practitioner will also devise a specific oral hygiene regime for you to follow including which cleaning aids and products to use. Follow up appointments to review, maintain or re-treat will be advised depending on which stage of gum disease presents. We strongly advise these follow up appointments are kept to prevent further progression of gum disease. Should you have advanced periodontitis or do not respond to treatment, a referral to a Specialist Periodontist will be discussed. We are privileged to have a Specialist Periodontist, Marina Arzoumanidi at our sister practice, ConfiDental Clinic, Clapham Junction, so referrals can be made swiftly and conveniently. If you have any concerns regarding gum disease, please contact our reception team who can arrange a check-up appointment.